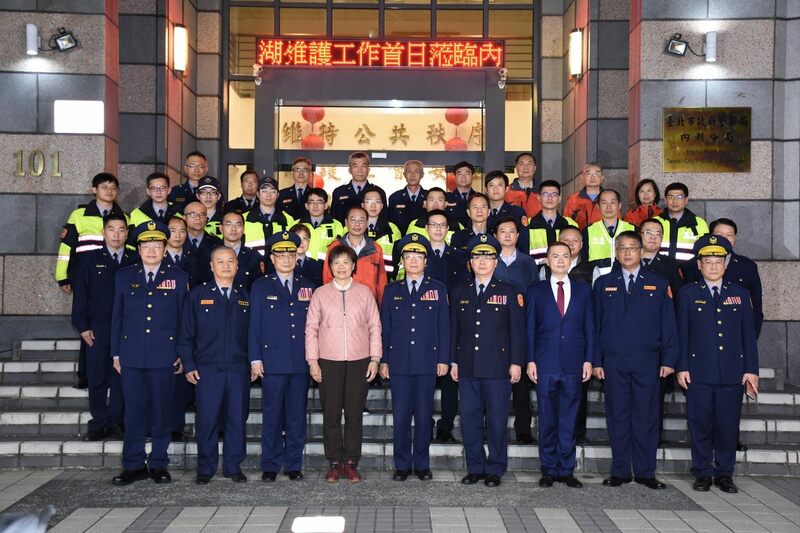 On January 28, 2019, the Neihu Precinct was honored with a visit by Administrative Deputy Minister of the Interior Lin Tzu-ling, National Police Agency Director-General Chen Ja-chin, and Taipei City Police Department Commissioner Chen Jia-Chang, who came to express the interior ministry’s appreciation for the hard work of the men and women in the police force. The visit fell on the first day of the Neihu Precinct’s expanded pre-examination education for safety work for major festivals. The dignitaries praised the police officers, traffic control volunteers, civil defense members, and neighborhood security patrol team members for their hard work and selfless dedication. The deputy minister bestowed group awards, rewards, and individual active citizen allowances, shook hands with the recipients, and took a memorial photograph with all present. Lasting fifteen days from January 28 through February 11, the safety and maintenance work revolved around three themes: public safety, smooth traffic, and peace of mind. 1. Public safety: In 2018, the Neihu Precinct conducted the Drug-Free Peaceful Communities Project and smashed four drugs trafficking gangs, arresting 11 big and small drug criminals, and seizing 40 g of drugs. In the Anti-Scamming and Pickpocketing Project, surveillance images of vehicles and persons around ATMs were analyzed and criminals were caught in the act and arrested. In total, 65 complicit drivers and 50 texting phishers were arrested, 13 people were arrested with a warrant, and two people were caught in the act. Five people were detained and an individual incarcerated, thanks to detective work tracing back to higher sources. The precinct also actively prevented 14 people from falling victim to scams. The total amount of scams prevented amounted to NT$ 11,956,620. In the Gun Sweep Project, four modified guns and five air guns were seized, and one criminal organization was locked down. 2. Smooth traffic: Personnel was dispatched to roads within the precinct to direct traffic and keep intersections clear. Traffic lights were optimized and major traffic violations were handled to reduce congestion and safeguard the public. In 2018, there were 580 cases of driving under the influence, 12,015 cases of ignoring red lights, and 16,338 cases of speed violations. 3. The people's peace of mind: To make the public feel safer during the Chinese New Year holiday, an event titled The Golden Pig Ushers in Good Fortune, The New Spring Brings Opportunities will be held on the first floor of Building 2 of RT-Mart in Neihu on Saturday January 26 to spread knowledge about crime prevention. At the event, police officers will show off their karate, dance, and combat skills and demonstrate techniques for surveillance, fist fights, and knife fights, which promises to be quite a spectacle. Games will enable parents and children to stretch their minds, have fun, and learn a thing or two. The Neihu Precinct said that in addition to mobilizing all its police manpower, it will also work closely with traffic control volunteers, civil defense members, neighborhood security patrol team members, and police volunteers to accomplish its tasks of public safety, smooth traffic and peace of mind, giving the public a worry-free start to a happy new year.